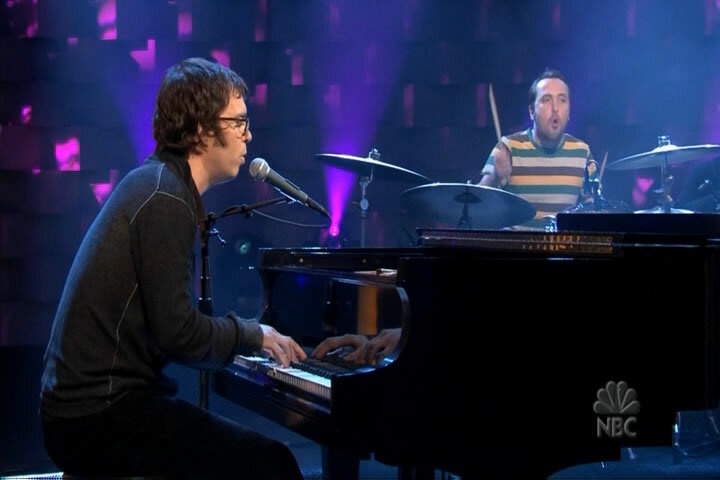 theSuburbs.org.uk - the original Ben Folds website - Conan performance - now in HD (and without Conan)! Conan performance - now in HD (and without Conan)! A much better quality download of Ben & co's appearance on Conan O'Brien has turned up on the internet in the form of a torrent. If any of you have yet to discover torrents as a way of downloading, I suggest you grab a copy of the Azureus client and read this tutorial. The file is a capture of the high-definition broadcast, straight on DVD-R giving us awesome quality. You can really appreciate the Lindsay's faces. You may need a special player to view the MPEG (not all players like these high quality MPEG-2 files) in which case grab VLC Media Player which is lightweight, free, and can run on pretty much any OS out there. Got all that? Well then head over to torrent spy and jump on the torrent! All seem a bit too much like hard work? Wonder if it's really worth the 200MB download? Here's a quick screen grab. It might be my imagination, but the audio mix seems a lot better too. Many thanks to caliban10 for the heads-up on this!